We have booked St John’s, and the church hall, and I have committed to making a Christening robe for my dear little grandson. When his brother Ted was Christened his other Grandma (Faye) offered the Christening robe worn by her son Shane, my son-in-law, when he was born in 1986. As you can see in the photograph this was a bright white frilly number that looked so sweet. But because Ted was 6 months old he was already getting a bit big for it. It wouldn’t do up at the neck, but no matter. This time we booked Kit’s Christening for 23 November thinking the robe would fit. Unfortunately Kit is growing so fast, and was already out of 0-3 months outfit by week four, that his Mum tactfully suggested she needed something a little larger. My kids weren’t Christened so I didn’t have an heirloom to share, but I offered to make something suitable. 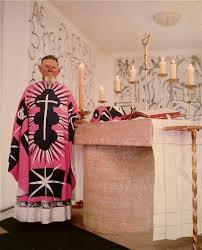 My first thought was the Matisse cut-outs exhibition which included a set of priests’ vestments to be worn at the Chapelle du Rosaire de Vence which includes stained glass windows and other decoration, all by Matisse. 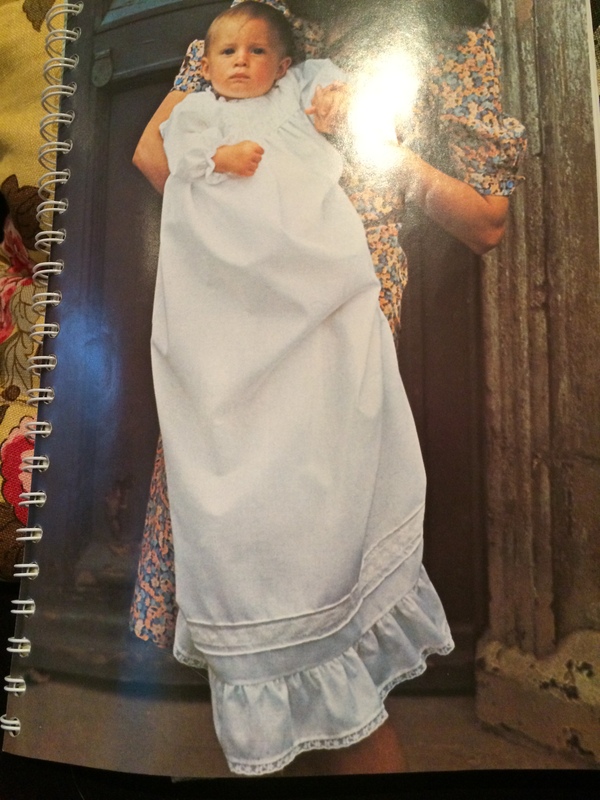 These marvellous garments inspired me to think about a Christening robe that was very colourful and celebratory. But when I shared my printing experiments with Esme she said she had had “something traditional” in mind. 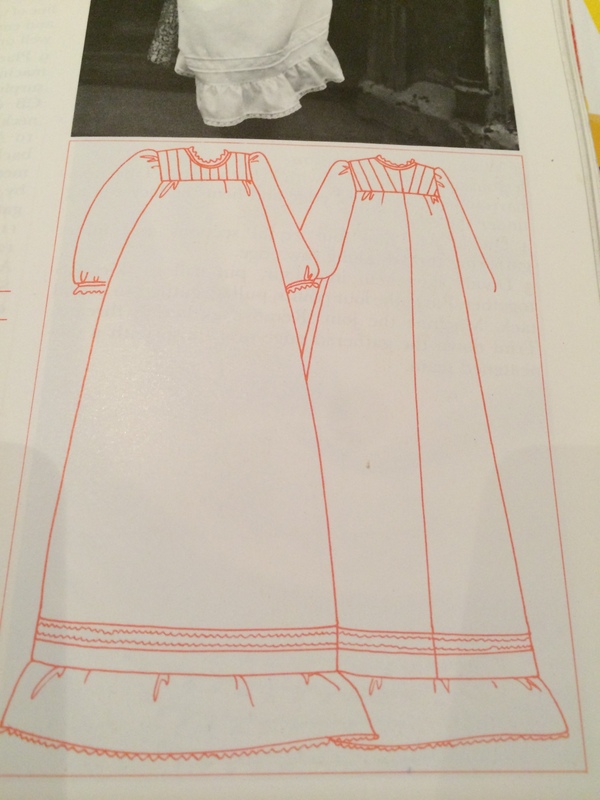 Luckily I had an old (1970s) Ann Lansbury children’s wear book with this gown in it. There is this version and a “patchwork” version which I think I will pass on. Its a pretty simple style – I suppose any competent seamstress in the past would have known how to put something like this together without a pattern, personalising it with tucks and lace that may have been saved from an old blouse, or the wedding dress. Historically this garment (rarely worn, even in a large family) was generally made in light cotton lawn or silk, and sewn entirely by hand. As you probably appreciate the garment is twice as long as the baby which ensures that he or she can be seen from the back of the church, or later in photographs. It’s a fairly showy garment and something that would be treasured. In fact there are dozens of beautiful ones available on the internet for £20-£30 so you might say – why bother making one that will certainly not be quite as fine? I suspect that Kit’s chubby little arms and neck would strain in a garment made apparently for a porcelain doll. And to be honest when my great grand children, or great-great grandchildren are dressed in this hand me down, do I want the parents to say “Yeah, in 2014 she got it on eBay for a fiver!”, or would I really like them to say “Great great Granny Kate made this, for Great Grandpa Kit! Look at the stitching! Look at those lovely little pin tucks? Isn’t it adorable?” Well that’s my fantasy anyway. When I make things for the family I really do put love into every stitch. Oh that’s beautiful. I agree – much nicer to make something with love than to buy something. 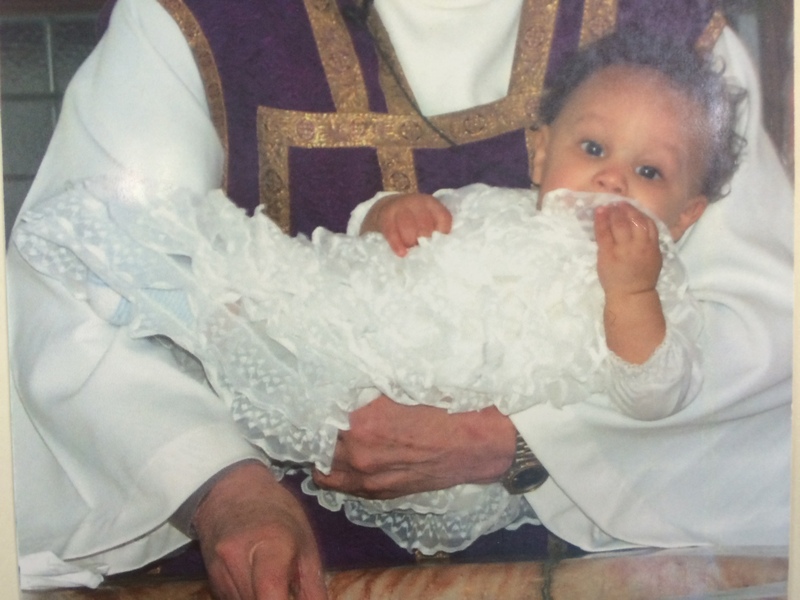 My grandmothers made all of our Christening outfits, although ours were knitted! Mine had a dress and a knitted lace shawl, which was very pretty (and I certainly hope my mom still has!) Fortunately, my mom also kept the invitation for the Christening so I have that in my album. Can’t wait to see your work.